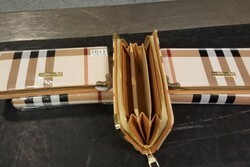 US customs officers in Dallas have seized counterfeit Louis Vuitton and Burberry wallets, valued at $32,000. The fake wallets - which were seized August 4 at Dallas Fort Worth International Airport and were destined for Ruston, Louisiana - were packed inside the suitacse of a passenger arriving from Narita, Japan with checked bags. During the inspection, officers discovered 58 brand-named wallets that appeared to be counterfeit - the traveler admitted the items he packed were counterfeit. "Packing counterfeit merchandise in suitcases doesn't release passengers from their obligation to adhere to US import laws," said Dallas Customs and Border Protection (CBP) Port Director Cleatus Hunt. "This seizure protects the trademark holder, their businesses and their employees and denies the counterfeiter from reaping profits from the sale of illegitimate goods."